Placing the Modern Chinese Vernacular in Transnational Literature. New York: Palgrave Macmillan, 2011. 190 pp. 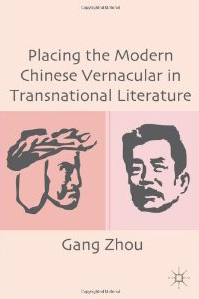 Zhou Gang’s Placing the Modern Chinese Vernacular in Transnational Literature makes a unique contribution to both the fields of modern Chinese literary studies and comparative literary studies. Focused on a specific period of historical transition in Chinese literary history (ca. 1895-1925) when the vernacular was elevated to the status of national written language baihua wen, this study also draws on a wide range of analogous historical junctures across the world, including the European renaissance, the Meiji period in Japan, modern Turkish language reform, as well as other events and phenomena. Engaging with the ideas of leading world literature scholars such as Wai Chee Dimock and David Damrosch, Zhou’s book also makes a significant contribution to world literature studies. A principal argument the book advances is that the inauguration of the vernacular in early twentieth-century China should be understood as a single episode in a transnational vernacular movement that has shaped literary modernity around the world. Following a nation-based model in literary studies, the triumph of the vernacular in modern China has often been discussed as something sufficient unto itself. Zhou’s study, however, places the Chinese vernacular in the context of other literatures. She teases out important threads in the formation of the modern Chinese vernacular that lead the reader into other geographies, other languages and literatures, but that offer new insights when the discussion returns to the central case of the Chinese vernacular. Zhou’s discussion of “vernacularization” both in China and beyond focuses on what she calls the condition of vernacularization. Here she does not mean the imbalanced power relationship between the so-called “center” (the West) and the nations on the “periphery” that may have prompted the collective desire on the part of the latter to vernacularize; instead, Zhou calls attention to “the precarious linguistic, existential and emotional conditions” within which the first modern Chinese vernacular writers adopted the vernacular as their medium of choice. She employs the term “Shaky House” (a state beginning with a revolutionary language choice, whose written medium manifests dramatic language change, bringing with it linguistic tension and precariousness) to describe the vernacular writing experiences of the May Fourth pioneers. It also deftly links the works produced in the vernacular by Chinese May Fourth writers to the literatures that emerged elsewhere at similar tension-ridden historical junctures of language change. Her study of the May Fourth writers and their counterparts in other nations: European writers from the Renaissance period, Japanese writers in the Meiji era, Taiwanese vernacular writers in the mid-1920s, and Turkish writers in the 1920s and 1930s, enables a comparative perspective that locates the Chinese case within a system of world literature characterized by variation. Chapter 2 examines a concept that is often circulated alongside the idea of the vernacular, especially in historical contexts beyond Europe – the idea of a “renaissance.” While the chapter focuses on the ways in which Hu Shi appropriated the “renaissance” in his search for a model for the May Fourth vernacular movement, it also contextualizes the Chinese case vis-à-vis an exploration of how the notion ofrenaissance and language problems intersected in modern India and the Arab world as well. By showing the different ways in which “modern literature” emerged from intralingual and translingual negotiation in these three communities, Zhou argues that the triumph of the vernacular in the context of world literature was often not a historical inevitability but rather a political choice. This is similar to what I have argued for in the case of poetry in China in The Subtle Revolution (2006), except that Zhou Gang deftly and admirably expands the scale to a global one. Chapter 3 calls attention to the “precarious linguistic, existential and emotional conditions” within which the first modern Chinese authors of fiction took on the vernacular as their medium for writing. Focusing on Lu Xun’s “Diary of a Madman” and Yu Dafu’s “Sinking,” Zhou argues that Lu Xun’s bi-lingual approach toward the vernacular and Yu Dafu’s multi-glossia endorsement of the vernacular may be seen as two poles of a wider spectrum of language attitudes shared by May Fourth writers. She also proposes her aforementioned term “Shaky House” as a new genre title to summarize the uniqueness of May Fourth vernacular writing and to link May Fourth vernacular writers to their international counterparts, whose writing also manifests dramatic language change and is fraught with linguistic precariousness. She mentions that Lu Xun virtually gave up on writing classical-style poetry during the May Fourth period, but went back to it in the 1930s (p. 81). In The Lyrical Lu Xun (1996), I suggested that there may have been sentiments he wished to express in old-style verse in order to elude the censors as well as to mock their ignorance. To confirm what Zhou argues, then, Lu Xun’s was indeed a bi-lingual approach to poetry. Chapter 4 discusses how the vernacular only writing mode, a monolingual idea institutionalized by the May Fourth vernacular movement, was pressed upon more conservative writers and groups in the early 1920s who were forced thereby to make difficult choices to readjust to a new linguistic-cultural landscape. Zhou’s accounts of Liu Yazi, Zhang Shizhao, Du Yaquan, and the Butterfly writers are engaging and compelling. In her discussion, the language transition is not just a series of ideological clashes, but rather a sequence of daily life dealings with which these writers had to come to terms. At the end of the chapter, Zhou again ventures into the world beyond China, for a provocative look at how “language wars” have been waged in different geo-political contexts. The epilogue discusses the reassessment of the May Fourth vernacular movement in China in the 1990s, which Zhou rejects as exhibiting “the same kind of ‘dualistic’ and ‘antagonistic’ mode of thinking” as the May Fourth radicals had toward the tradition they were rebelling against, only now it has been aimed (by cultural conservatives such as Zheng Min) at repudiating the May Fourth vernacular movement instead of traditional literature written in classical Chinese. She also addresses the hostility between scholars of world literature and specialists in the study of national literatures in American academia, the end to which she suggests will come about with the realization of the vital, yet indirect, relation between the two. Let us hope so. I can’t say enough in favor of this book both in terms of how it adds to our understanding of the development of the new literature in China from the perspective of Chinese Studies and for what it says about the development of Chinese literature as part of world literature. Zhou Gang is a scholar with a unique feel for the singularity of the moment and the sophistication to articulate it within a world context. She does not jump to hasty conclusions, nor does she let herself get mired in generalization. With the level of insightful and informed scholarship that this book represents, Zhou Gang is at the top of her generation of Western-educated Chinese scholars of comparative literature. The book contains copious endnotes, an extensive bibliography, and a useful index. For my tastes, it could have included a glossary of Chinese characters, but strictly speaking, that is not a necessity in a book addressed primarily to a comparative literature readership. Kowallis, Jon Eugene von. The Lyrical Lu Xun: A Study of His Classical-Style Verse. Honolulu, Hawaii: University of Hawai’i Press, 1996. —–. The Subtle Revolution: Poets of the “Old Schools” During Late Qing and Early Republican China. Berkeley: Institute of East Asian Studies, University of California, 2006. —–. Warriors of the Spirit: The Early Classical-style Essays of Lu Xun (University of California, Berkeley: Institute of East Asian Studies, China Research Monographs Series, forthcoming.